Joy Blackwood, joined the board in September 2014. Joy is responsible for the Refuge Association’s urban wildlife refuge program. Working in partnership with 14 urban refuges around the nation both on-the-ground and at the national level, she will help to bring forth their visions for the future, provide technical assistance, support collaborative efforts that raises awareness and elevates the importance of wildlife refuges in urban areas. 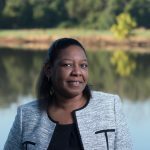 Prior to joining the Refuge Association, she led the development of the Green Leadership Trust, a network of board members of color and indigenous leaders and established a first-of-its-kind partnership with Green 2.0 for environmental nonprofits to publicly release their organization’s diversity data. Before working with the environmental sector, Joy spent many years managing multi-faceted public health education and training programs; advocating to end the AIDS pandemic; fighting to reduce the stigmas of the disease and empowering underrepresented individuals and communities. Joy’s passion for protecting the majestic places we so cherish is deeply rooted in her British and Jamaican background, as well as the years she devoted to changing the public’s opinion and understanding of the green movement and the benefits of the great outdoors. Alan Girard, Jr. joined the board in 2009 and oversees the Chesapeake Bay Foundation’s environmental protection and restoration programs on Maryland’s Eastern Shore, where he leads the organization’s regional efforts to help communities reduce pollution to the Bay and its local rivers and streams. Alan has developed public policy, coordinated local and statewide advocacy campaigns, and engaged citizens, businesses, and government in solutions to pollution control challenges. Alan did his undergraduate work at Ithaca College and has a Masters in Environmental Management from Indiana University. Before joining CBF, he was a manager at Pickering Creek Audubon Center, and did conservation work in Indiana, Montana, Rhode Island, and Vermont. Alan serves on a number of boards and committees and lives with his wife and three children in Easton, Maryland. Larissa Johnson joined the board in 2016. After receiving her MPA in Environmental Science and Policy from Columbia University, Larissa made her way to Maryland to be closer to all the federal action. But soon after arriving here, she discovered that Maryland was a microcosm of what is happening around the country so she didn't need to travel anywhere else. She has worked as an Environmental Justice and Climate Fellow for the NAACP, Maryland Climate Coalition Coordinator for the National Wildlife Federation, and led the Climate Change Maryland Program until 2016. She is now working at the County level. As the Residential Energy Program Manager, she works to ensure that Montgomery County residents reduce their greenhouse gas emissions, switch to clean energy, and keep money in their pockets. Mary Ellen Kustin, joined the board in 2014. She is the director of policy for Public Lands at the Center for American Progress (CAP). Prior to joining CAP, she was a senior policy analyst on food, agriculture, and conservation issues at the Environmental Working Group. Ms. Kustin has also worked on conservation and environmental campaigns for the Pew Charitable Trusts and the National Wildlife Federation. Ms. Kustin grew up in South Carolina but she and her family have called Maryland home since 2006. She holds a master of science degree in sustainable development and conservation biology, as well as a master’s degree in public policy, focusing on environmental policy, from the University of Maryland. She earned her bachelor’s degree in mathematics from the University of South Carolina.